Explanation: The combined light of the stars of the Milky Way are reflected by this cosmic dust cloud that soars some 300 light-years above the plane of our Galaxy. Dubbed the Angel Nebula by astronomer Steve Mandel's 13 year old son, the dusty apparition is part of an expansive complex of dim and relatively unexplored diffuse nebulae, traced over large regions seen toward the North and South Galactic poles. 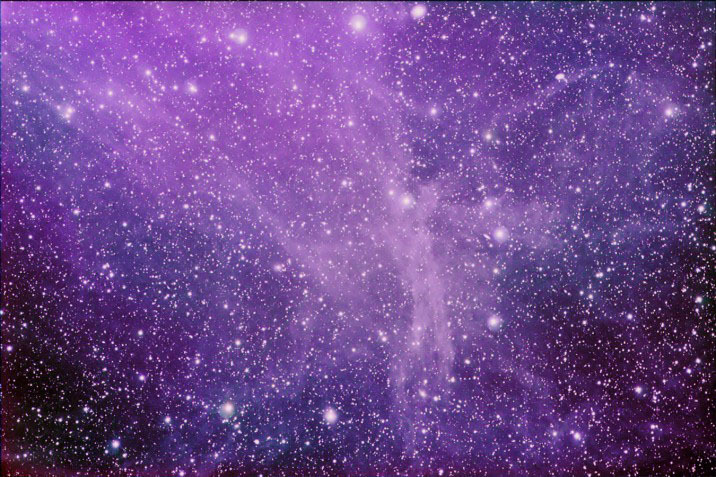 Along with the blue tint characteristic of more commonly observed reflection nebulae, the Angel Nebula and other dusty galactic cirrus also produce a faint reddish luminescence, as dust grains convert the Milky Way's invisible ultraviolet radiation to visible red light. Spanning 3x4 degrees on the sky in the constellation Ursa Major, this wide-angle, high-resolution image was recorded as part of the Unexplored Nebula Project.